I had quilted it before my machines decided they needed checkup, so the unbound quilt stayed in my sewing room while I focused on a few other things. But I just finished it up first thing after I got my machines back the other day. I’ve updated the pattern and put it on the free patterns page. Just look towards the bottom of the page for “Palace Tile”. I decided that I really need to get where I’m totally comfortable with this swirl - so I did it again - and you will see it several more times in the near future! Well, I’m not totally satisfied with my own swirl, but I’m not scared of it anymore. So, it’s time to get it better and better…and then maybe I’ll start working on variations! I think I’m particularly a slow learner when it comes to this quilting thing - so I’m not pushing it - I’m just expanding my repertoire as I feel ready. 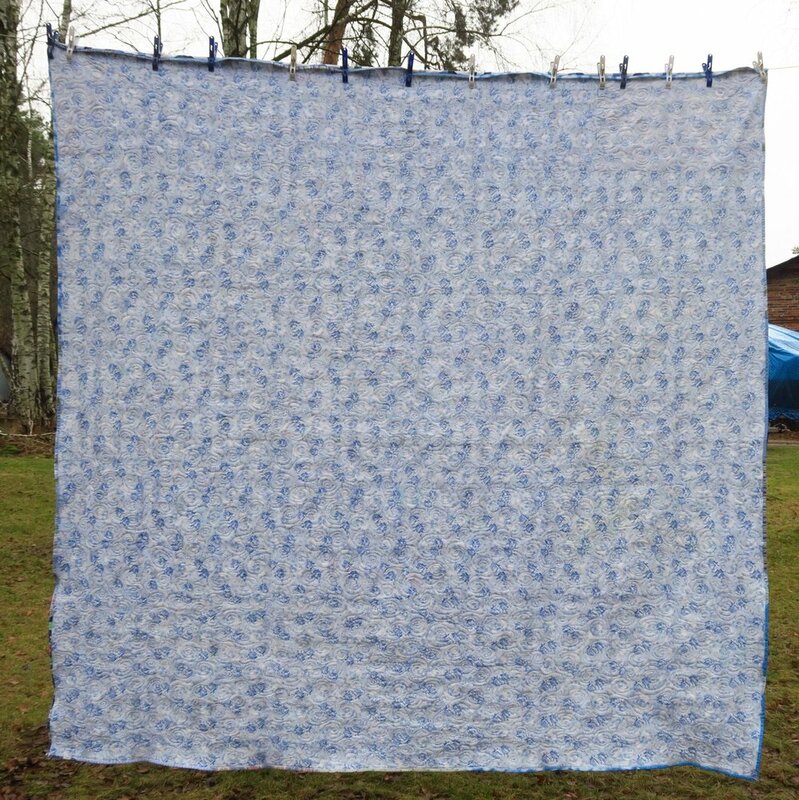 Each of the quilts I’ve quilted with this design, however, I’ve really liked. Maybe it’s just coincidence, or maybe the design of the quilting itself is helping me like them! I don’t know! I think it’s a big part - the quilting. 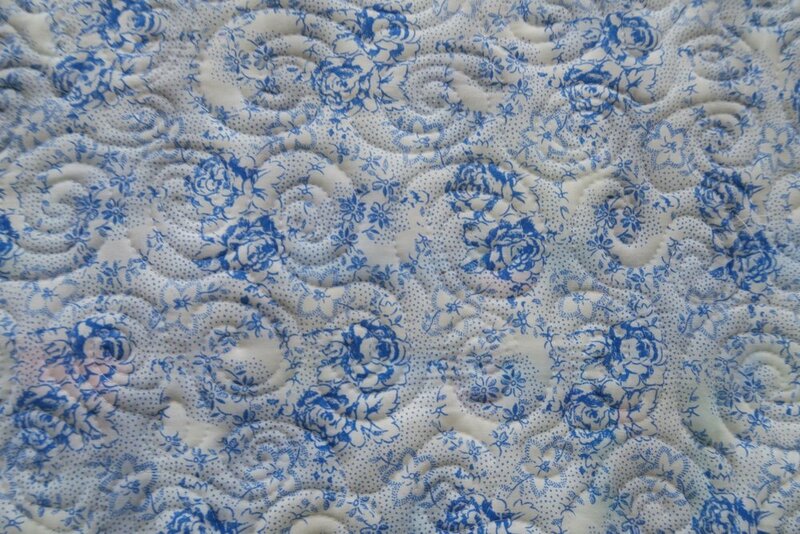 This was an all upcycled blues quilt - remember that series? - i started it over a year ago now! Yikes! Time flies. While I liked the design while it was still on my computer screen, as I was working on it I got really excited about it. I like how the blues graduate. I even don’t mind the various pinks that show up in the final quilt - while at first I found them irritating - as the fabric had some pink flowers in it (mostly blue, of course), but now I even sorta like them. It provides a few bright spots! And now you know - this is one of my recent finishes! Oh - if you are a newer reader here and didn’t realize it, you can find my whole “upcycled blues” series here - all on one page. Don’t forget to check out what my sis has for you over in the store! Don’t run out of supplies in these winter sewing months! Check us out if you haven’t yet!